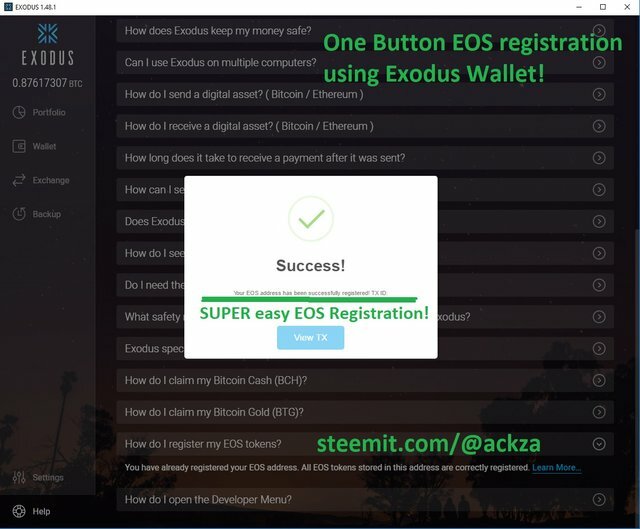 SUCCESSFUL EOS Registration on Exodus Wallet with ONE BUTTON! Here is what the FINAL Screen after a successful Registration looks like! I love Green Pixels and Checkmarks :D They should have added a sound effect though :D Now Exodus just needs STEEM/SBD! This will change things for EOS, this tool is going to be the MOST popular way to hold EOS tokens, and when people find out Exodus has a built in Shapeshift Exchange that requires 0 paperwork and no registration, they will LOVE Exodus! AND when Exodus adds USDT Tether this month, we will see for the first time a very user friendly consumer wallet giving it's users the ability to easily sell Bitcoin (or altcoins) with ONE button! No paperwork and no registration, andUSDT Tether. That's too good to be true. Wait... Hold on a sec.. Like you mean, with my wallet statement I could earn advertising too? That sure will make a huge difference. @ackza I really like Exodus and you have some Great Ideas and I hope Exodus is listening to their customers to make their Wallet even Better and Better ! PLEASE write longer messages! If you leave short one or two word comments like this, they hget mixed in with spame and may even get flagged by steemcleaners! PLEASE write long comments! @ if you don't speak engl;ish THAT IS Ok just write in your OWNlanguage! Use google translate to translate or right click and "translate to English" is on google chrome, so I can read whatever language you write! Chrome has auto translate and it works great! It lets me speak with all the russian spakers on golos!